Just to say thank you so, so much for spending the day with us at Kerem today. The children thoroughly enjoyed the amazing olive press workshop and they learnt so much about the process of making olive oil. We are really grateful to you! I just wanted to thank you for volunteering to blow the shofar again at this year’s Maccabi GB Community Fun Run. It really does add an element to the event by blowing the shofar before each distance. The Maccabi GB Community Fun Run continues to unite Jewish people in the community and holds a positive message that no matter who you are, you can be part of the event and be active together whilst raising money for worthwhile Jewish charitable causes. I hope you were able to see this on Sunday! Thank you again and we would love to have you blow the shofar again next year! 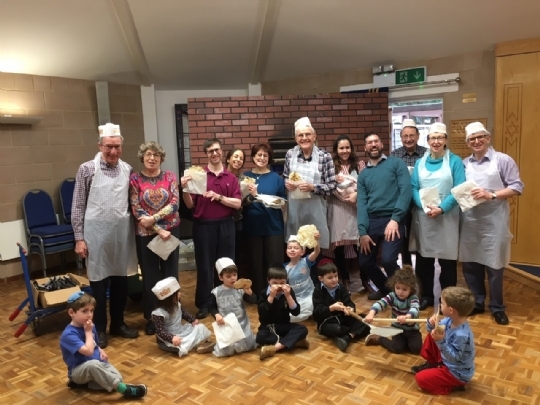 Many thanks to Rabbi Simon and Tzivos Hashem for the very enjoyable Matzah Baking Workshop at Northwood Shul this afternoon. Both the young and not-so-young attendees had a great time! Photographic evidence of satisfied customers is attached! Thank you for doing such a beautiful programe for our boys! It is greatly appreciated. A huge thank you for all of your hard work on behalf of our boys. They have gained so much from the programe. Thank you both and Tizku L'mitzvot. A Freilichin Purim! I am sorry that I did not manage to write to you sooner! I would just like to say how much we enjoyed having the Olive Press Workshop for Chanukah. It was a lovely experience for our pupils - and staff too! Thank you so much! It was a pleasure to meet you on Sunday for the lighting of the Menorah at Golders Green. I thank you for the kind gift, which has made its way safely to my desk! Thank you very much for the wonderful Shabbath we had at your place when we were in London. It was a memorable event had in London & the Shabbat at your place added to the limelight. We also saw the wonderful servive you & your wife are giving to the community members & tourists like. Thank you again for a beautiful event. The children (and parents!) loved it and we are getting great feedback! We just want to thank you so much for the excellent model matza bakery. It was fantastic to see the 5 year olds and the 92 year olds learning and enjoying together! We are looking forward to you coming again, perhaps in Elul and hopefully more people will come to participate and be inspired by your sense of humour and educational workshops. Wishing you continued hatzlocha and a kosher in Freilichen Pesach. Thank you so much for a wonderful workshop today, the Teacher told me, the kids really enjoyed it! Thanks and hatzlocha in your great work. Good Morning. It was so good to meet you at the Brit Mila last week. Tamid beSemachot. .... The crafts are all packed up as party bag stuff for the Kol Chai young members. Your service was exemplary and I shall certainly use you again. Best wishes - enjoy Chanukah. An amazing workshop (matzah bakery). 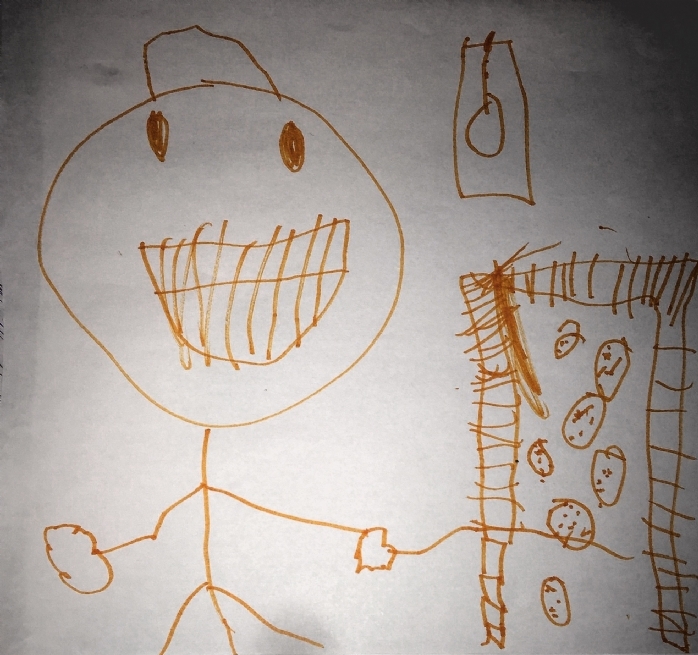 The boys drew their pictures (impressions), to express their apprecitation and memories. Thanks so much, the resources really enhanced my lesson! May you have lots of hatzlocha in your avodas hakodesh, with no stress and worries. We wish you a Shana Tova U'Metkua, and warmly thank you for your welcome, for your shabbat meals. May Hashem give you all the best and berachos for the new year! Many thanks for the dual date calendar. As usual it is much appreciated. Earlier in the year I had the pleasure of coming to your Friday evening Shabbat dinner, together with my cousin and a friend. 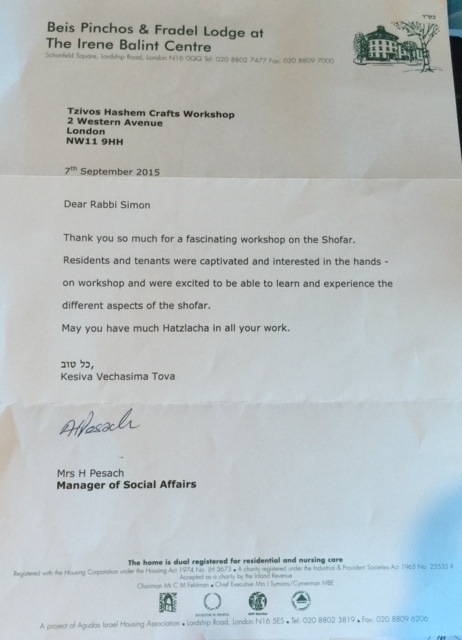 I would be grateful if you or anybody at Tzivos Hashem would let me know if you have any more Shabbat dinners. Best Wishes, and a happy new year to you and all at Tzivos Hashem! Thank you for all of your visits to Magnolia Court, my father really enjoys the time he spends with you and your family. Wishing you and all your family a healthy and happy new year. Thank you so much for your time this morning. It was very much appreciated and I found our discussion very interesting. I think it’s always healthy to take time to truly think about a relationship and this will prompt us to take time out to take a considered approach. Thanks too for the loan of the book. It will be well used, but returned promptly in good condition! I have sent a note to our planner to ask her to contact Rabbi Mendi to see if he will do Tefillin with me before the Chuppah – it was lovely to do it today. Again, thank you for your time – it was very much appreciated. I should like to thank Tzivos Hashem and Rabbi Simon for the interesting and informative craft show. It was truly wonderful and much appreciated. All the children enjoyed it so much especially the printing. I and the children look forward to future visits. Shalom Rabbi Yossi, Thanks very much for the lovely kiddush last Friday. Everyone is still talking about it, they enjoyed the kids company so much and would love to see them again, soon! Thank you so much Rabbi Simon for a fantastic workshop! All the year 2 classes (and their teachers!) really enjoyed it. It was informative, interesting and interactive for the children, and it really enhanced their learning of the mitzvah of Kashrus. 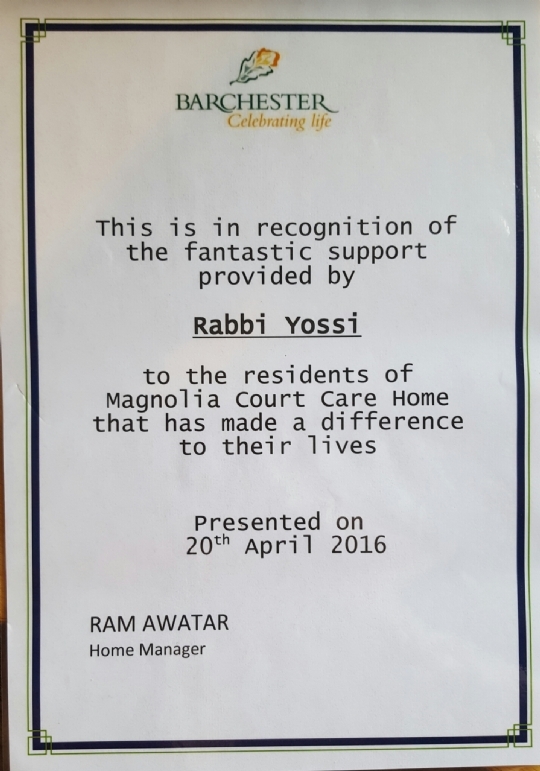 Dear Rabbi Simon, my husband has sent you a donation to your charity as a thank you for visiting Magnolia Court on all the holidays. My Dad really enjoys your visits as He is no longer able to participate in family Yomtovs in my home.. It also gives me great comfort to know that after enjoying his entire life as a traditional Jew he is now not forgotten. We wish you and your family a kosher pesach. Thank you so much for the phenomenal matza bakery event. It was engaging, hands-on and a lot of fun. The day was a real success - parents, children and teachers all thoroughly enjoyed it and we've had great feedback. Hi just wanted to say a huge thanks for sending me a new Shabbos Times fridge Magnet. Really missed it when someone took it off my fridge and didn't put it back!!!! Thank you so much for enhancing our Chanukah with the most beautiful choir. Tenants and residents were delighted to see your young happy faces, you created such a wonderful Chanukah atmosphere at our home and cheered up so may sick and elderly. Thank you or coming to do the olive press with the children yesterday. They all really enjoyed it. Thank you so much for coming in to run 2 sessions for our year 13 students this morning. They thoroughly enjoyed it and we all really appreciate you taking time out of your busy schedule to come to Borehamwood! You had well thought out aims for the session, and delivered them in a fantastic and accessible way, ensuring the students understood the concepts you were teaching and took something tangible away from the session. Yesterday was a fantastic session for the Jewish class, again a first for Eton and very historic to have a Sukkah built at the college. My thanks to you for your commitment and hard work. The feedback I have had yesterday and today has been very positive. There is no doubt that we are bringing to the Jewish boys a level of Yahadut that they would not otherwise have the chance to experience. I am very pleased that we also attract to the sessions quite a number of the wider Eton College community and this can only be for the good of all of us. It is an important part of the hasbarah for Judaism and Israel that is also central to my work at Eton. My thanks for providing the food and refreshments which I know is always appreciated by the boys. Our non-Jewish visitors were so impressed. Thank you. We would like to thank you so much for making the time to bring your Oil Factory workshop to Tuffkid Nursery. The children were absolutely mesmerised by the whole process. It brought the oil-making process to life for the children and they really enjoyed it. It was so great to have you at our Chanukah lighting last week and to meet your lovely family. It was a lovely occasion. Thank you so much for your hard work and contribution. I do hope Rabbi Yossi's throat is improving. We are all the more of a community because of what the Rabbi and you bring to our school. Thank you for the Chanukah supplies, it is great to have a U.K provider. Thanks for another blockbuster event this morning! Enjoyed by all - children and adults alike. We are doing fantastic and really settled well into the Jewish community..
Also, thank you for the Purim present. It really brought a smile to our face and reminded us of the great times we had at your house, starting with the wedding lessons and then the Friday night dinners etc. We hope you and your family are all well and we have made a small donation to your charity which I hope helps with the great work you do. Thank you so much for running 3 successful programmes on Monday. The children very much enjoyed learning about the various mitzvos of Succos. I just wanted to thank you for your fascinating presentation at Bridge Lane Beis Hamedrash chanuka party yesterday.The children, and parents, enjoyed it thoroughly. Thank you for inviting me to The Lighting of the Giant Menorah on Sunday 1st December which was a most enjoyable occasion. I very much enjoyed the visit. Please pass on my very best wishes and thanks to everyone concerned. Many thanks for your wonderful work! Chanuka Sameach! We are so grateful to Chabad and Zippos Circus and the Zippos Circus staff who put on such fabulous kosher entertainment every sukkos. 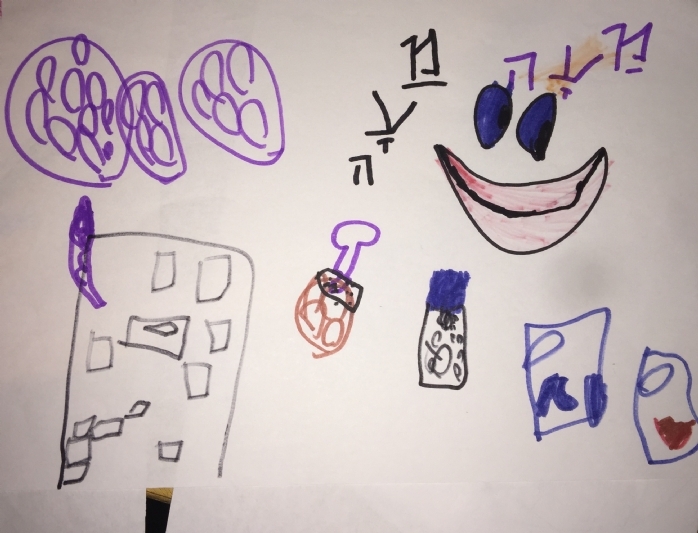 Seeing what you do for Chanuka is amazing. It is a proper publicising of the miracle. Exactly as Chanuka is meant to be. We are so lucky to live in a country which encourages us to promote and be proud of our Judaism. And the way you take that forward is really wonderful. Shalom Rabbi Yossi. Thank you very much for the Purim sweets. You really made the difference this year for my kids!. The girls are always very happy to give tzedaka through the app. Hope you and your family had a good Purim. I am always happy to see all your hard work to keep traditions and the sense of community alive. Hag sameach! Thank you Chanie and Yossi for a wonderful Friday Night dinner.Thank you for letting us share in the birthday celebrations! Chanie, thank you for all your hard work and for inviting me to join you. Shabbos with your family is very special. It is always an honour to spend shabbos with you and your family!